Afternoon all! In contemplating my post for today, I thought to myself, "what is interesting and is going on with me right now?" I answered myself, "why, my weekend, of course!" Yes, I do talk to myself in my head. I hope that's not weird. And as for *how* interesting my weekend is, I suppose that is in the eye of the beholder. *I* find it interesting. One can only hope that no one reads this post and thinks to themselves, "oh that poor woman, she really thinks *that stuff* is interesting." Ah well. There's only one way to find out, no? -1- Sunday is the Feast of the Presentation of the Lord, otherwise known as Candlemas. I posted about this yesterday, as I enjoy this day each year, as well as the feast of St. Blaise, coming up on Monday February 3rd. People get down on February, but it has some great feast days in it. #thisissoobvious ;-) It also has my birthday in it, so February has always been a hidden gem of a month to me. Although I will grant, the older I get the more my birthday seems like a looming punishment rather than a happy occasion, but I digress. -2- Speaking of feasts, Monday will herald my next review in the Let Us Keep the Feast series of books! 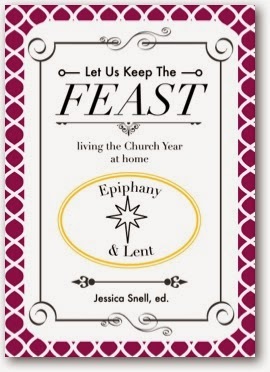 This installment will be for the Epiphany/Lent volume, complete with a giveaway. There is also a discount code that I will post if you'd like to purchase the book or the Advent/Christmas volume. Come back Monday for more feasting talk and fun! -3- This coming Sunday is also Scout Sunday in our parish for Hank's cub scouts troop. Henry, adorably enough, was chosen to bring up the gifts during Mass, and I'm just bursting my buttons with pride and Catholic mom positive energy. The entire family is attending to see Henry in his big moment. Afterward, we will be having doughnuts and juice in the Parish Center while the kids conduct the Pinewood Derby. I think Anne will enjoy all of this too, and I'm terribly excited. -4- Sunday is of course, also Super Bowl Sunday. Is it me, or is the Super Bowl actually the crappiest game of the entire season if you're a football fan? I mean, if your team is in it, then disregard my statement, because of course that is different. But otherwise, the Super Bowl bears no resemblance to a good old fashioned football game. It's all marketing drama and the half time show...don't even get me started. We're actually DVR'ing the game so that we can delay our start time and skip the half time show. We're also having some friends over, so you know what this means. I'll be frantically picking up toys from right out of Anne's hands and making complicated snacks in the kitchen (that I've never tried to make before, but I think they sound *really impressive* so I'll try to make them anyway) to the detriment of my own emotional health. I'm planning a chicken wing dip and possibly a party bread. Do you think I could pull off Tapenade? See what I mean? -5- I am also planning this weekend to engage in some Lenten preparation. Yes, I know that Lent is over a month away, but it never hurts to be overprepared does it, gentle reader? My impetus for this endeavor is the upcoming Olympics, and the fact that every two years I select a knitting project to complete in its entirety during the two weeks of the games. It's quite fun. What does this have to do with Lent? We're getting there. :) I have Lent crafting projects planned, and I thought the Olympics were the perfect opportunity to tackle and finish them before the end of February. 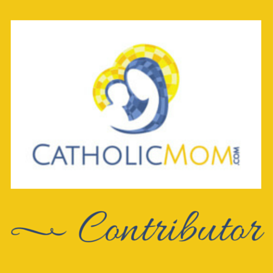 Some of them are gifts, and I want them to get to their recipients prior to Ash Wednesday. You're trying to imagine a Lenten knitting project? Never fear, I will provide details when they are finished. Let's just say a lot of purple yarn will be involved. -7- I'm currently reading a fiction book that I'm really enjoying, called The Amish Bride, by Mindy Starns Clark and Leslie Gould. This is book three in the Women of Lancaster County series, and I have enjoyed the other installments that I have read. The plots are much more complex than other Amish romances that I've read. I highly recommend! I have a meeting (what have I done to deserve this?!) so I have to run. Enjoy your weekends, everyone! 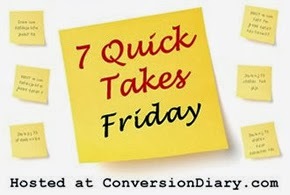 And head to Conversion Diary for more 7 Quick Takes! Talk to you on Monday!